Forgiveness is a divine virtue which if practiced in true spirit transforms the life of the forgiver as well as the forgiven. In all religions of the world the practice of forgiving is held with the highest respect. Cynics believe that the one who is meek, the one who is weak only forgive, the strong takes the revenge for a wrong done, or hurt afflicted. But if we just ponder over the history of world or the stories of Hindu scriptures of Ramayana ad Mahabharata, we will find that the the lack of attitude of forgiveness is the root of all troubles which leads one to a gory future. It keeps a person in agony and pain and it gets ingrained in our subconscious mind which may surface at any time with the slightest provocation. A hurt inflicted and a hurt received both create impressions in our subconscious mind unless and until we learn to let go and forgive. That is why in Vedanta, Buddhism it is taught to pray for the peace and happiness of the enemy also. Those who follow Vedantic tradition pray to God to grant happiness even to their enemies. They pray to Providence not only for their well-being, but also for the prosperity of their adversaries. Vedantic wisdom believes in a pre-natal harmony, a link and celestial communion among all souls. Hence, when you hate another person, you only hate yourself, as all souls are linked. By being unforgiving, we keep creating an identity around our pain, and that is what is reborn, Buddhists believe. In Jainism, forgiveness is propounded as one of the main virtues to be cultivated by the faithful. Supreme forgiveness forms part of one of the 10 characteristics of dharma in Jainism. Studies at the University of Wisconsin found the more forgiving people were, the less they suffered from a wide range of illnesses. The benefits included improved functioning of their cardiovascular and nervous systems. Anger and resentment towards our so-called oppressors will bring us nothing but trouble and unhappiness. But preaching forgiveness is easy but practicing what you preach is difficult but not impossible. Relationships flourish when we have two qualities gratitude and forgiveness. Any relationship be it parent child, husband wife, friends, siblings, colleagues, senior-junior always have encountered the crossroad of forgiveness and resentment. The road we choose has an impact on our relationship positively or negatively. I also am no exception from this experience of bewilderment as to forgive or not. The most touching relationship is father daughter. As a daughter I also am very attached to my father. But one decision of my father hurt me and I took it as a major barrier to my progress in my career. The year I passed out from my engineering college, my father retired and our family relocated against my will in Burdwan a sub urban township in west Bengal, where job prospect for an engineer is almost nil.I wanted to stay in Kolkata with my friends where I could have availed many opportunities. But he was not ready to leave me alone as I was a girl. This was because of his protective nature as a father and during my time parents were not so comfortable with the freedom of a daughter. I was just 22 years full of vigour and enthusiasm and wanted to stand on my own feet. But he insisted on my trying for only govt jobs. He didn’t like the idea of me working in a private firm. When I passed out in nineties In India finding a Govt job was very competitive and job prospects were not so much open. So for almost one year or more I was without a job after passing out. The procedure in Govt jobs then from applying to appearing for written test, interview and result was almost six months or more. I gradually became depressed and I was totally in turmoil and resentment built up against my parents specially father. I had to take medicines for depression then my HOD of my college offered me to work as a part time lecturer in my Engineering college. This way my career began with many ups and downs. I got selected for Management studies but again due to financial problem I could not pursue. I occasionally had fights with my father and blamed him. Finally I was selected in good Govt job in a upcoming mordenized thermal Power plant I was happy and so was my father, who always told me to be patient. and persevere. For many years I had that hurt feeling for my father and could not forgive him. But then my father met with a fatal accident and by the grace of God survived. During that period when my father had severe head injury, I prayed to Lord for his recovery, and realized the value of relationship, realized what my father meant to me. The prayers for my father gradually washed away those hurt feelings with my tears. I learnt to let go of those feelings which was like a wall between me and my father who was ever compassionate with me. I learnt to forgive him as well as myself for misunderstanding my father. Sometimes as children we don’t understand the love of our parents who always want the best for us. Our views may be different because of generation gap but we can always have a dialogue and sort out things peacefully by convincing our parents. Life inflicts us with blows to teach us lessons we need to learn if we do not learn otherwise. Many times small bickering take large volume and hurts our ego in Husband wife relationship. Specially in todays society when both men and women are equally educated capable of earning the ego clashes are quite common. This is also the root cause of breaking of many households and umpteen number of divorce cases are in rise. If during those hot moments we just step back and look at all the happenings , we will realize that the issue is very small and its better and wise to forgive and forget and start living afresh. Actually when we want to move forward we have to put one foot down. So if one of the two is wise enough to step down a large problem can be avoided. 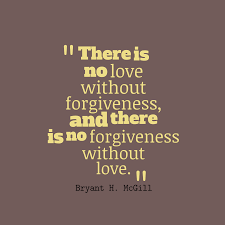 So forgiveness is a major factor in building cohesiveness in husband-wife relationship in married life. So there is a secret power in forgiveness . It enhances love ,fosters respect and flourishes our lives with fulfilled and healthy relationship. So always build your bridges and cross them with a smile…..